Caroline Maria Noel (1817-77) is the composer of this popular hymn, 'At the Name of Jesus'. It was originally designated as a processional for Ascension Day and appeared in Mrs Noel's The Name of Jesus and Other Poems of 1870. The author was the daughter of an Anglican clergyman. She spent the last 25 years of her life bedridden by a painful and crippling illness and much of her time was spent composing hymns for fellow sufferers. Before this illness Caroline Maria Noel had tried her hand at composing poems but gave it up. This however changed when she became an invalid as she took advantage of her situation to compose a lot of poems and hymns. 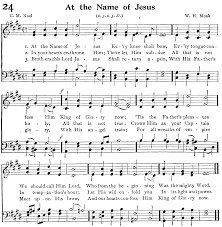 Below are the lyrics of 'At the Name of Jesus' hymn. Below is a video of this song.